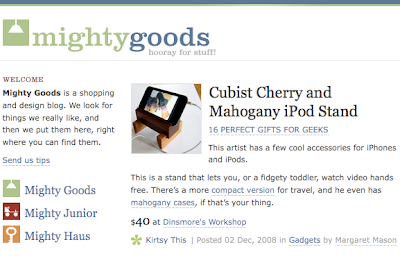 Mighty Goods featured one of my stands on their website yesterday. It was one of the 16 Perfect Gifts for Geeks! Click on one of the links to read all about it. It was nice to be featured as a gift item! An iPod Classic Case is also featured as a gift item on 'Gifts for Him' in Etsy - http://www.etsy.com/gift-guides/him/61?&page=5.